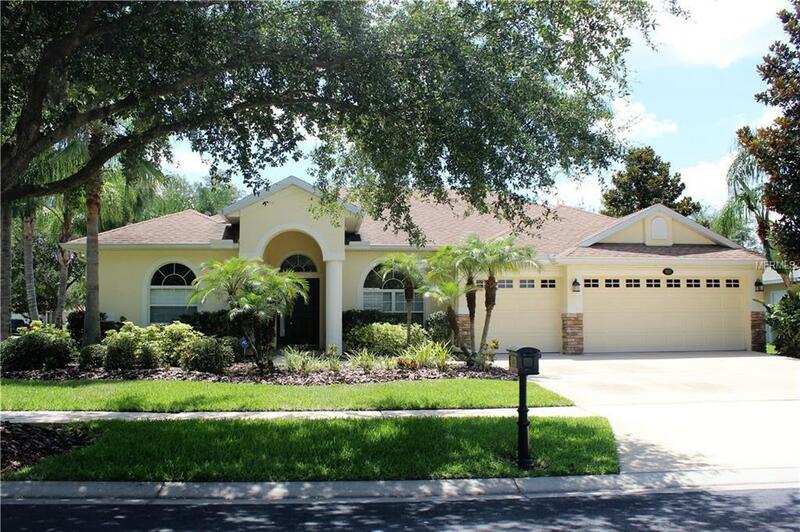 Immaculate 4 Bedroom, 3 Bath Pool Home with a 3 car-garage located in the gated subdivision of Orange Blossom Creek with no CDD! Amazing curb appeal on almost a 1/3 of an acre, corner lot which can be fenced with HOA approval has mature landscaping including beautiful Queen palm trees. The home is pristine inside and has been exceptionally maintained by the original owner. This split floor plan home features an oversized Master bedroom with a sitting area, tray ceilings and dual walk in closets; the master bath features dual vanities, frameless glass shower and separate tub. The 3rd bathroom is also a pool bath accessible from the screened in pool area. In addition to the 4 bedrooms there is a learning center/study which can be used as a small office, study, or sitting area. The kitchen has a separate eat-in area and opens up to the family room with vaulted ceilings. Sliding glass doors in the living room and family room open up to the screened in pool area so you can enjoy the cool weather in winter. The community is centrally located just off the Veterans Expressway making it an easy commute to Downtown Tampa, Tampa International, Citrus Park Mall and anywhere you need to go in Tampa. Located in a great school district! Make an appointment today, you will not be disappointed! All Information deemed reliable; buyer to verify.